A Heart's Desire: Welcoming a New Year! I love the New Year! It always feels like a great fresh start and it is invigorating to think about the changes that I want to make in the new year and the hopes of what it will bring. 2012 has been a really great year but an interesting one none the less. In 2011 I started this blog and a new job and we put our first house on the market. We also built the first house in the neighborhood we are developing. Last year for New Year’s in THIS POST I stated that in 2012 I wanted to live more simply and my two big resolutions goals were to become more physically and financially fit. Well a lot happened this year!!! January I started off with a lot of furniture painting and completed many projects. I took you on a tour of the house we built to sell in the neighborhood. In February this blog turned 1! In March, I turned a year older and we got an offer on our house. I posted one of my most popular posts to date. 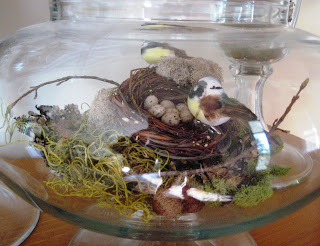 I made these great bird nest for my apothecary jars and it was a hit. P.S. they still look exactly the same! In April the blog started to suffer. I had a yard sale to get rid of all those things we didn’t want to move and in May we really started to pack. In June we went to the Bahamas. As soon as we got home, we moved, as in the day after we returned!! Crazy! We moved into the new home we built since it was still on the market. Just in time for me to decorate a Summer Mantle. In July we started to settle into the new home and I decided the green front door had to go, so I painted that a calmer blue. I received a free kitchen island and I gave it a face lift. This post gained a lot of attention, since I was featured over at Southern Hospitality!! Then we received an offer to purchase this house! One month later!! So on August 10th (exactly 2 months from when we moved in), we moved again…this time we moved in with family and we have been with them since. I caught you up on a furniture project I did just before the move. And I showed you a small makeover. In September we stayed really busy and went to Atlanta, GA where I finally got to go to a Pottery Barn Outlet and then we went to Charleston, SC where I found some pretty neat stores and dream homes too. In October I shared with you our simple living quarters and we started construction on another house in the neighborhood. I also painted a little jewelry box. I attended the first annual Southern Bloggers conference and met some really great ladies and found some really cool blogs! In November I helped my friend paint her dining room hutch and table. In December I was super busy with Christmas festivities and I did not get a lot accomplished that was blog worthy except this table décor. Whew! That was a busy 2012! The blog definitely suffered this year, my post count was chopped in half. I am really sad about that but there was no way I could continue to rehab a lot of furniture projects during packing and moving and now not having a work space. Selling two houses in 2012 was a huge blessing and we are so very grateful for that! Looking forward to 2013, we are excited about what the year will bring. First up will be moving again. We can’t live with Family forever…even though they are great helpers in our busy life!! We have completed a new home build in the neighborhood and have it on the market to sale as well. We having a closing date set and will move into the home if it does not sell first, when it sells we will most likely rent for a while. I do look forward to having my furniture back and a space we can call our own. As for those New Year’s Resolutions for 2013…..well, I am very serious about losing the weight I have gained! I am going to join the thousands of others that know they need to be better. I bought a juicer today and I am very excited about adding in more fruits and vegetables into my busy lifestyle. Meal planning will become a habit I hope and I am slowly going to add in the excersing again too. My other resolutions will be to continue down a good financial path and spend less. I still follow some of Dave Ramsey's Principles. Read more of the bible daily and lastly, stop playing so many games on my phone!! What are your resolutions for the New Year? ?